In my ongoing quest to rid the world of this horrible thing called paper, I suddenly realized it’s all about atoms and bits. 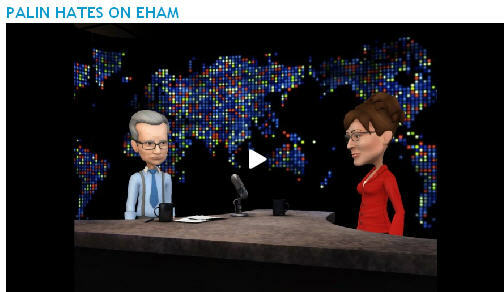 I know, I know… You are thinking “What the heck is EHAM talking about”. Let’s start with some simple definitions. Atom: a basic unit of matter which is the building block of everything in the universe. Bit: also know as a binary digit. Computers use bits to determine the value of data and instructions. Byte: is 8 bits. 1 English letter or character equals 1 byte. Atoms are expensive. Assuming that my calculations are correct, there are about 91 billion trillion atoms in 1 sheet of paper. A standard sheet of letter sized paper is 8.5 inches by 11 inches which translates to .2159 meters by .2794 meters. According to answerbag.com, the thickness of a standard sheet of letter sized paper is 0.00003 meters which is 111,111 atoms. With that, we calculate the width of the sheet to be 799,628,830 atoms and the length to be 1,034,813,780 atoms. As we all know, volume = length * width * height which gives us a total of 91,940,678,300,260,581,191,400 atoms which is 91 billion trillion atoms. I hope these calculations are correct. It’s been 25 years since my last high school chemistry class and 23 years since my last college chemistry class. A big shout out to Mr. Keeney from Walled Lake Western High School and Dr. Hammer from Michigan State University. I have not talked to these dudes in over 23 years. 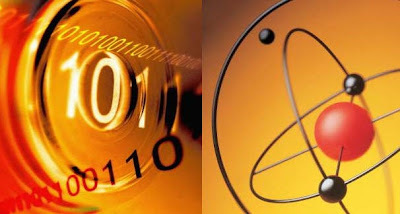 As of May of 2010 a standard 1 terabyte (1 trillion bytes) hard drive weighs about ½ of a pound which is about 36 trillion trillion atoms. We can fit about 40 characters on a single line on a sheet of people. We have about 50 lines total on both sides of a sheet of paper thus we can fit about 2000 text characters on a double sided sheet of paper. A piece of paper weights about 1/100 of a pound. 50 sheets of paper weighs about ½ of a pound and is about 36 trillion trillion atoms. 50 sheets of paper can store 100,000 characters which is 100,000 bytes. Storing data as bits is 1 million times more efficient than storing data as atoms in the traditional method (ie paper). Bits are cheap and become cheaper every 18 months. Atoms are expensive and are potentially damaging to the environment to harvest. In a contest of Atoms vs. Bits, there is no contest. Bits win! 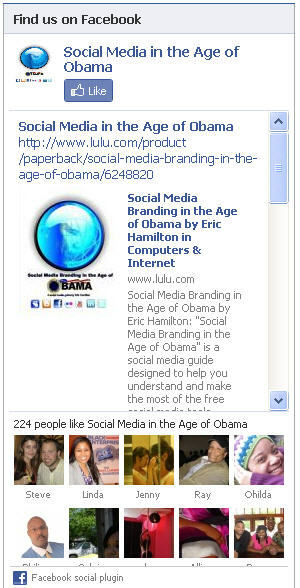 Many of you know that I recently wrote a book titled "Social Media Branding in the Age of Obama". The book is not political and mainly focuses on social media technology that Barack Obama used to get elected. In addition, I started the Web Academy which offers free web design to anyone interested in learning. I recently got a lot of hate based on the success of my book and the Web Academy. I created this 2 minute video which is based some recent hate that I received. This is a spoof and is not intended to speak negatively about political parties. Facebook has opened up its “Like” feature. Now, you can insert a Like Box into the body of your web. With a Like Box on your web site, you can integrate your Facebook fan page experience and your web site experience. Check out the video.